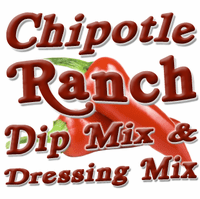 Description: Ranch is America's condiment and we've kicked it up a notch with smoky chipotle peppers. We've found just the right blend of spices and fresh-tasting herbs to make a familiar favorite with a touch of heat. 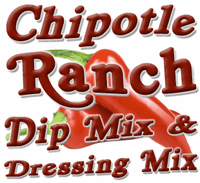 Not only can you make a Southwest ranch dressing or a creamy ranch dip with this mix, it also seasons potatoes, pork chops, meatballs and more! Abbreviated Ingredients: onion, sea salt, herbs and spices, garlic, chipotle pepper, yeast extract, vinegar powder. Packaged in a facility that handles wheat, milk, soy, egg, peanuts, and tree nuts.